What are involved in the cost of designing a Responsive website? Responsive Design isn't always the cheapest way to build a website, but building a single site which offers the optimal user experience to every visitor offers businesses a much better Return on Investment. As a rule of thumb, a Responsive Design website costs more than your average website to build and run, but creating an effective business website is more than a numbers game. When weighing up the costs, you need to keep in mind that a responsive website works much harder for you than your standard desktop-centric website. The primary goal of Responsive Design is to put the user first by delivering a dynamic website which offers the best user experience on devices of all shapes and sizes. It's also ready to support new devices as they hit the shelves. In return you don't need to build and maintain a separate mobile-friendly website for your business, nor do you need to build and maintain a suite of mobile apps to cater for all the various devices on the market. Once you consider these significant upfront and ongoing savings, Responsive Design can be a wise long-term investment for your business. So why does a responsive website cost more? Because it requires more planning, development and testing upfront to ensure that you're offering a smooth and intuitive user experience to everyone who visits your website. 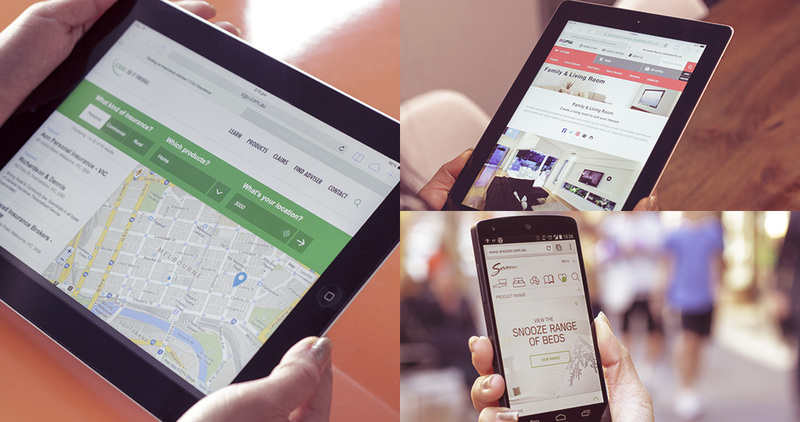 Building a responsive website means planning ahead to cater for a range of devices, screen resolutions and contexts. Responsive Design doesn't just resize webpages on the fly, it actually restructures the page layout, content and menu structure to prioritise features depending on the end device and the context in which it's used. This means planning ahead to consider what various users will most want from your website. For example, you might make contact and location details more prominent on mobile devices to cater for users on the go. Responsive Design generally has little impact on integration with a back-end Content Management System. You have the benefit of relying on our single 1800myweb Platform to cater to all devices, but it is important to ensure that it supports this approach and doesn’t interfere with the rendered HTML and CSS based on the custom design that was done. This is one phase where considerably more work is involved compared to designing a desktop-centric website or fixed-width designs which only cater to a handful of device classes. While building a responsive website is certainly not as much work as painstakingly building new pages for every different screen size and shape, the developers do need to consider that any screen could be used to view the site. This means developing multiple versions of many page components, and selectively displaying them based on testing across the full range of possible screen sizes. As always, the aim is to offer visitors the optimal user experience. A classic example of this optimisation is the main menu or navigation tools on a website. On the full desktop site, the main navigation tools might be a horizontal list of large, text links. On a small mobile device they might become a drop-down menu, perhaps hidden behind an icon in the top corner. On a tablet, one or the other approach may work, or perhaps a third approach which requires further collaboration with a designer. Depending on the complexity of the design it's possible the amount of development effort, testing and quality assurance can be much higher than that of a single, fixed-width layout. It’s not always necessary to design every possible screen layout for every possible device or resolution, but Responsive Design does require more consideration regarding how each screen is going to adapt and respond at different sizes and in different contexts. The aim is to put in the hard work here to eliminate ugly break points and offer a smooth and intuitive user experience at all times. It's naturally going to take longer to test your responsive website across many devices, rather than just ensuring it looks good on the desktop and treating other visitors as second-class citizens. At the same time, Quality Assurance and Testing for a responsive website is less demanding than undertaking the same task for separate desktop and mobile websites, or a suite of mobile apps.